Looking for the perfect present for a loved one this holiday season? 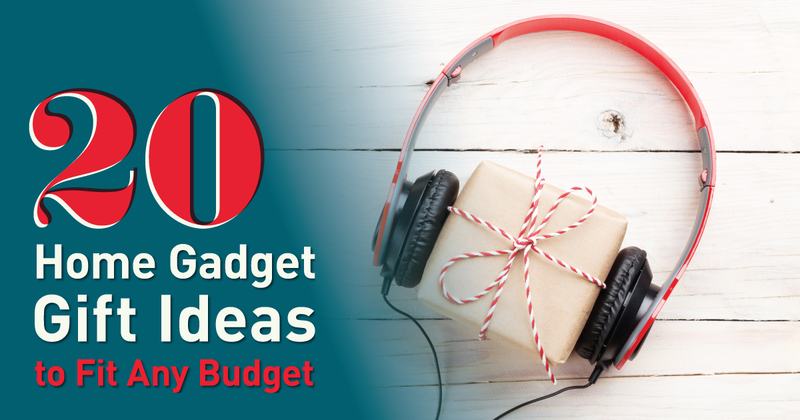 We’ve rounded up 20 of our favorite gift ideas. And since we work in real estate, we focused on items that add enjoyment, comfort and, in some cases, major value to your home. From music lovers to home chefs, we’ve got something for everyone. And we’ve included a range of price points to suit any budget, from under $50 to major splurge … in case you’re feeling extra generous this year. We hope you find this list useful in identifying gifts your friends and family will love. And maybe some of these items will make your wish list this year, too! Heat things up this holiday season! Keep your loved ones cozy all winter with these gifts that add warmth and a touch of luxury. On cold nights, nothing beats the comfort and glow of a fire. Whether you’re looking to cozy up on the couch with a good book, or enjoy a relaxing night in the backyard with family and friends, a tabletop fireplace is an easy way to light up your evening. The Regal Flame Black Utopia Tabletop Fireplace can be used indoors or outdoors, no vent required. It runs on ethanol, which can be mixed with citronella to double as a mosquito repellent for outdoor use. Who wouldn’t love to wrap themselves in a warm towel when they step out of the shower on a cold morning? While heated towel racks are available in a variety of styles and price points, the Anzzi Glow 4-Bar Electric Towel Warmer in Polished Chrome is an entry level version that gets good reviews. Modern and elegant, this model plugs into a nearby outlet for easy installation and is made of rust-resistant stainless steel. Turn your daily shower into a spa-like experience! Now you can wake up to a warm house, even if you like it cool while you sleep. After using the Nest Learning Thermostat for a week, it will start to recognize your patterns and adjust the temperature automatically to your preferences. In its third-generation, Nest claims to pay for itself over time in energy savings. It uses sensors and your phone’s location to check if you’ve left the house, then sets itself to an Eco Temperature. And this smart-thermostat knows when you typically get home from work and can heat things up before you return. If your schedule changes, you can even adjust the temperature remotely from your smartphone. Radiant heating has been a popular alternative in new construction to traditional forced-air heating systems. And new technology has made it easier and less expensive to retrofit existing homes with radiant heating. According to BobVila.com, “radiant floors are heated either with electric resistance cables or hot water flowing inside tubing” beneath the floor. It’s energy-efficient, effective, and doesn’t blow dust and allergens around the way forced-air systems do. Not only will you love stepping onto a heated floor on a cool morning, you’ll be adding value to your home, as this is an appealing upgrade to buyers when it comes time to sell. It’s holiday music time! Music lovers are sure to appreciate these gifts guaranteed to enhance their listening experience throughout the home. Whether you enjoy singing in the shower, or listening to your favorite podcast, the H2oVibe Rain Showerhead Jet with Wireless Bluetooth Speaker syncs with any bluetooth-enabled device so you can stream your favorite music or other audio directly into the shower. The waterproof speaker easily detaches from the showerhead so you can bring it with you from room to room while you get dressed. And the showerhead itself features jets with three times more spray power than the average showerhead, creating a spa-like experience. Smart speakers like Amazon Echo and Google Home not only stream music on demand via voice control, they can also serve as a central hub for numerous other smart-home devices. Now you can change the channel on your TV, make a phone call, turn on your lights, set your thermostat and lock your front door, all without lifting a finger. If you prefer a premium speaker, the Sonos Play:3 is the mid-range option in the brand’s line of wireless speakers. It delivers rich and robust sound with a sleek design that can placed horizontally or vertically to fit almost any space. Sonos speakers sync with Amazon Echo and Alexa, which enable you to control the speaker with voice commands. And you can easily add additional speakers from the Sonos line for an enhanced, surround-sound experience. The sky’s the limit when it comes to whole-home audio systems, and for a premium sound system you can expect to make a significant investment. Companies like Yamaha offer a wide variety of components, all designed to work in conjunction to give you a customized whole-home audio and home theater system to suit your needs. Home chefs will love these gifts, perfect for holiday entertaining and home cooking all year long. Not only will they bring excitement to the recipient, everyone in the family will benefit from the delicious dishes these gifts are sure to inspire! Warm, fresh bread can make any meal feel special. With a bread machine like this one from Hamilton Beach, you can enjoy fresh rolls, pizza dough, cakes, jams, flatbreads and croissants with minimal effort. Plus, there’s a gluten-free setting, which makes this a perfect gift for anyone avoiding gluten in their diet. If you love to barbecue, the Char-Broil Deluxe Digital Electric Smoker gives you the tenderness and flavor of smoking meat, without the hassle. The integrated meat probe alerts you when the meat reaches a predetermined internal temperature, and when it’s done cooking the “warming” feature keeps your food hot until it’s ready to be served. Sous vide is a method of cooking in which food is vacuum-sealed in a plastic pouch and then placed in a water bath to cook at a precise temperature. The new Mellow Smart Sous Vide Appliance hits the market this holiday season and promises to make sous vide as easy and foolproof as a slow cooker. Its built-in cooling system keeps your food cold until it’s ready to be cooked … so you can stick a piece of salmon in before you leave for work, choose the time you want it to be ready, and dinner will be done when you get home. To really heat things up in the kitchen, any home chef would love a new high-end range, like this 36” Dual Fuel Range with Six Burners from Sub-Zero Wolf. With ten custom cooking modes—including one for proofing dough and one for dehydrating—and a temperature probe alert, this oven makes cooking almost foolproof. And the timeless stainless steel design will enhance the beauty of any kitchen. Investing in a high-end range not only adds enjoyment to meal preparation, it’s highly-desired by home buyers … something to consider if you plan to list your home within the next few years. Holiday lights aren’t the only way to make a home sparkle. These cleaning gadgets and appliances will keep your home clean and shiny all year long … and hopefully bring some joy to the cleaning process! Anyone who has pets or young children will love the convenience of a cordless and portable spot cleaner like the BISSELL SpotLifter 2X Portable Deep Carpet Cleaner. Its cleaning brush agitates soiled spots while simultaneously sucking up debris. Use it to remove small spills and stains from carpet, furniture, rugs, drapes, car seats, and other upholstered items. Robotic vacuum cleaners have been around for years, but new technology has made them more effective and lowered the cost significantly. The ECOVACS DEEBOT N79 Robotic Vacuum Cleaner provides a good mix of features and value. It offers several cleaning modes and moves easily from rugs to tile to carpet. You can also control it with your smartphone using the ECOVACS App. While a high-end dishwasher with all the bells and whistles can certainly be a good investment, there are some great values on the market for those with a more modest budget. For example, the Maytag Front Control Dishwasher gets consistently great reviews for its powerful motor that disintegrates bits of food to deliver sparkling clean dishes, even without rinsing. And its elegant exterior will upgrade the look of your kitchen … all without breaking the bank. If anything can make laundry exciting, it’s a new washer and dryer with smart-technology like the Kenmore Elite Smart Washer and Dryer. Now you can start a load of laundry remotely from your smartphone to time it with your arrival home. You can also customize washer and dryer cycles and receive an alert when a cycle is complete. And with the Express cycle, you can wash and dry a small load in 45 minutes, saving you time and energy. Nothing is more important than the safety of you and your family. Protect your loved ones—and deter intruders—with gifts that keep you and your home safe and secure. The Philips Hue White Smart Bulb Starter Kit is a good entry-level investment in smart lighting technology. Now you can automate your lighting and control your lights from your smartphone using the Philips Hue App. Deter burglars by making it look like someone’s home when you turn your lights on remotely. And stay safer by never entering a dark house again. Plus, it has several options to enhance the look and ambiance of your home lighting. Watch over your home and greet visitors from your computer or smartphone with a video-enabled doorbell, like the Ring Video Doorbell 2. Adjustable motion sensors alert you when someone is approaching your door, and live video and audio allow you to see and talk to visitors without opening the door, even if you’re away from home. The best part is, they’ll never know you’re not home if you don’t tell them. Control and monitor your locks from anywhere with a smart lock like the August Smart Lock Pro + Connect. Now there’s no need to leave a key under the doormat or give a copy to the housekeeper. You can activate keyless access remotely, and even lock up when they leave, all from your computer or smartphone. And no more fumbling around for your keys in the dark. Similar to keyless entry for your car, Smart Lock Pro automatically unlocks your door when you approach. An in-home security system is still one of the best ways to protect your home and family from intruders and alert you to the presence of smoke or carbon monoxide. Some companies, like Vivint, can integrate your security system with video monitoring, a doorbell camera, smart locks, garage doors and even your thermostat. Prices vary depending on the options you select, and a monthly monitoring service is required, but a home security system can bring peace of mind knowing your family and home are protected. As real estate professionals, we get to visit people’s homes every day and talk to buyers and sellers about their favorite features. So we have a unique insight into the elements that truly make a house special, bring joy to homeowners and add value to a home. Did we miss your favorite home-related gift? If so, we’d love to hear about it. Please share in the comments below! If you do decide to “splurge” on a home upgrade, contact us for recommendations on the best options for your particular home. Buyer expectations and preferences vary depending on price point, style of home and neighborhood. We can run a comparative market analysis to find out how the upgrade you’re considering will impact the value of your home, before you make the investment. I am passionate about helping people which is why I'm passionate about real estate. Owning your own home is part of the American Dream. It is stability. It is community. It is also one of the greatest tools available to generate wealth & create a legacy for your family. As a Senior Sales Associate at Terra Firma Global Partners I offer concierge-level service to Buyers & Sellers of Real Estate in Sonoma County. Whether you are looking to buy your first home, re-size to meet your current needs, or invest in real estate to build wealth for your future. I would be honored to help you navigate your real estate journey with integrity, wisdom & vision. A graduate of UCLA with a BA in Philosophy, I worked for 8 years as part of a top producing RE/MAX team in Los Angeles prior to my move to Terra Firma Global Partners.